» Sound: an indented section of coastline, with numerous inlets and islands. This map shows the Clayoqout Sound watershed, on the west coast of Vancouver Island, British Columbia, Canada. 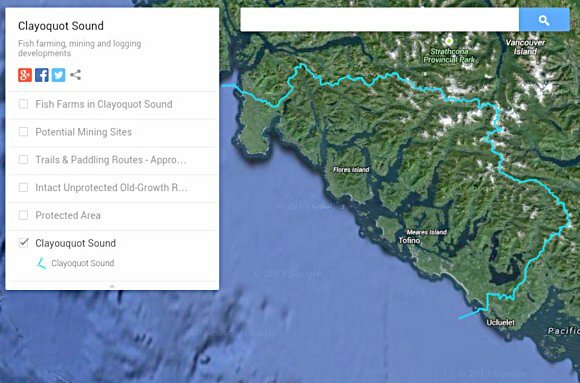 Click to open a zoomable, interactive Google map with layers showing old growth, protected/unprotected areas, fish farms, potential mine sites, hiking/paddling routes, and more about Clayoquot Sound. Thanks to volunteer Veronika Degmayr and her GIS skills for creating the map! The land portion of Clayoquot Sound is 272,000 hectares (2,720 square kilometers or 1,050 square miles), comprising about 8% of Vancouver Island. Clayoquot’s mountains, valleys and islands are covered with majestic ancient temperate rainforest that contains some of Canada’s oldest and biggest trees. The remaining 78,000 or so hectares of Clayoquot Sound consist of ocean – narrow inlets of the Pacific Ocean, into which empty rivers and lakes. Here, where ancient forest meets ocean, the estuaries and tidal zones contain some of the world’s greatest coastal marine-life diversity. There are five communities in Clayoquot Sound with a total population of about 3,000 – the town of Tofino and four First Nations villages inhabited by Nuu-chah-nulth tribes (Ahousaht, Hesquiaht and Tla-o-qui-aht). Industrial activities such as logging, salmon farming and mining exploration continue in Clayoquot Sound, despite its designation as a UNESCO Biosphere Reserve in 2000. But most of the Sound is still undeveloped, and the spectacular scenery and wildlife attract over 750,000 tourists yearly. Since the late 1970s, Clayoquot Sound has been the site of campaigns and protests to save its globally rare ancient temperate rainforest from industrial exploitation. These efforts continue.